President Donald Trump addressed the controversy Thursday during a joint press conference with French President Emmanuel Macron. President Donald Trump might have left the United States, but questions about his son's previously undisclosed meeting with a Russian lawyer have followed him to Paris. "My son is a wonderful young man," Trump said during a joint press conference with French President Emmanuel Macron. "He took a meeting with a Russian lawyer — not a government lawyer, but a Russian lawyer. It was a short meeting." The lawyer has denied working for the Kremlin. 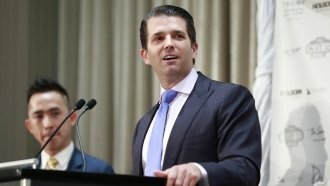 The publicist looking to set up the June 2016 meeting told Donald Trump Jr. the lawyer was a "Russian government attorney" who claimed to have incriminating information about Hillary Clinton. That publicist also told Trump Jr. the information was "very high level" and "sensitive" and part of the Russian "government's support for Mr. Trump." Trump Jr. ended up agreeing to the meeting. "Most people would have taken that meeting; it's called opposition research," President Trump said. "I have only been in politics for two years, but I've had many people call up, 'Oh gee, we have information on this factor or this person or frankly, Hillary.' That's very standard in politics." Although Democrats appear to be more outspoken, several Republican lawmakers have criticized the meeting. "Nothing happened from the meeting; zero happened from the meeting," President Trump said. "And honestly, I think the press made a very big deal over something that really a lot of people would do."